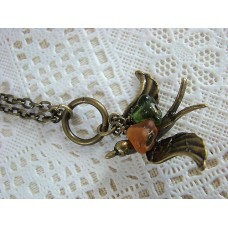 Unusual, original and different!A glass bottle pendant, full of antiqued silver skull beads, with a ..
Two swallows fly down to a vintage brass locket, with a beautiful green glass flower. 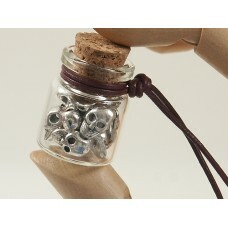 Locket opens. ..
Treasure of the forest floor, a single flower hangs by itself. 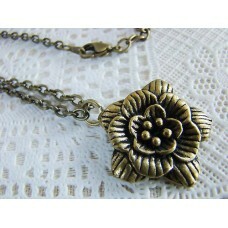 Flower measures 1 inch in diameter.. 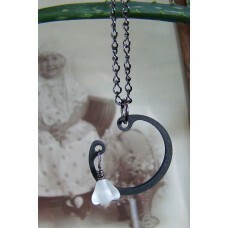 Icy white flower hangs from black moon shape, hanging from black chain. 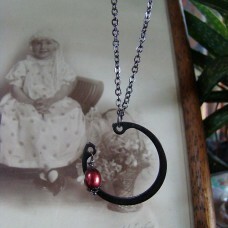 'Moon' is 1 inch in diamete..
Rich burgundy red fresh-water pearl hangs from black moon shape, hanging from gunmetal-black chain.'.. Long silver-tone cluster necklace. 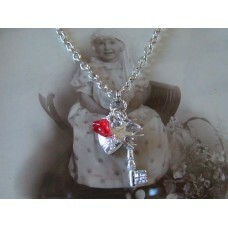 Bird, Key, Red glass flower charm, Locket. Secrets. 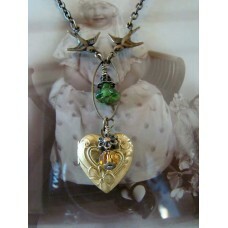 Locket opens ..
Antiqued brass swallow flies beneath big loop, with hand-wired red and green Czech glass flowers. ..